Salty or sweet, funky or fresh, these preserved foods improve every meal. 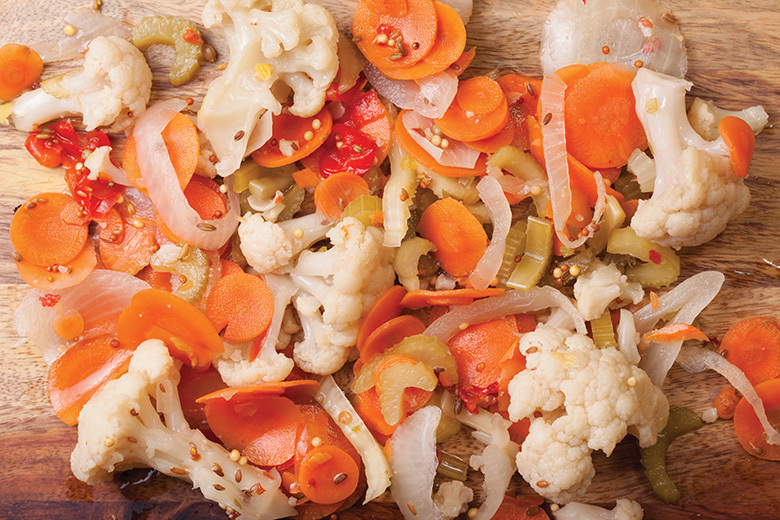 Scoop up some of Britt’s Mix, a relish of cauliflower, carrots, celery and peppers. There are few foods as polarizing as pickled foods: You either love the fermented funk of these preserved foods, with their vinegary punch and abrasive saltiness, or you can’t stand ’em. We’re happily in the former camp. And in our current culinary scene, the sky’s the limit when it comes to what can be fermented or brined, be it cauliflower, cherries or even the occasional herring. Chef Renee Erickson was Seattle’s pickling pioneer, pickling fruits (cherries, plums, figs, etc.) under the Boat Street Pickles label. Sadly, after more than 20 years, those pickles are no more; fortunately, there are others to fill the void. Pickled foods provide a necessary contrast to foods that are too rich, and they are a healthy way to add intense flavor without fat. If you’re looking for locally preserved produce, these purveyors are our jam—find them at your local specialty grocer. The Britt of Britt’s pickles is Britt Eustis, who built a career in marketing and distributing produce to mainstream grocers. His reverence for simple vegetables shows in his process; unlike heat-treated vinegar pickles, Eustis’ are fermented naturally (broken down by lactic acid bacteria) in oak barrels. The resulting pickles (five cucumber variations, plus kraut and kimchi) are tangy and salty, and are claimed to be very healthy for your gut. Photographs by: seattle pickle co. (beans); stopsky’s (olives); emerald city kraut (kraut). From left, Seattle Pickle Co., Stopsky’s Pickles and Preserves and Firefly Kitchens. The beloved jewish deli of the same name closed its doors in 2014, after three years on Mercer Island, but its pickles live on. Its head pickle purveyor is Katy Lauzon, who worked at Stopsky’s Delicatessen and helped develop recipes for the limited list of products: giardiniera, olives, pickles, beets and brandied cherries. A lifelong Seattleite, founder Chris Coburn grew up picking produce: blackberries up the street from his Queen Anne family home, and fruit and veggies from U-pick farms in Duvall and Skagit Valley. His pickle recipe is a family one, with flavors reminiscent of the salty Puget Sound waters, he says. The menu of products—sweet pickled beets, spicy beans and variations on the signature dill—is short, but each is distinctly flavorful. Like Britt’s, this line of more than half a dozen different kimchis and sauerkrauts is naturally fermented, making Firefly popular with the health-conscious farmers’ market set. You can find them seasonally at a number of local markets, and year-round at the Ballard Sunday market. Cofounders Julie O’Brien (who is the owner) and Richard Climenhage launched the business seven years ago. If you have the opportunity, sign up online to take one of their fermentation classes. Photograph by Krista Marie Nelson Photography. There’s a tiny amount of work to be done before enjoying Quickles ($5), made with a pre-packaged pickling concentrate: You must procure cucumbers (or really, whatever vegetable suits your fancy) and cut them up. But then the Quickle concentrate turns your boring bowl of produce into delicious pickles overnight (the kind you needn’t bother canning because they’ll be gobbled up quickly).